Cloisonné enamel design in both <i>muse</i><i>n</i> (no wires) and <i>moriage</i> (layers of enamel in relief). The copper bodies of the vases have applied silver rims, silver-gilt inner neck-rings and silver base plates. 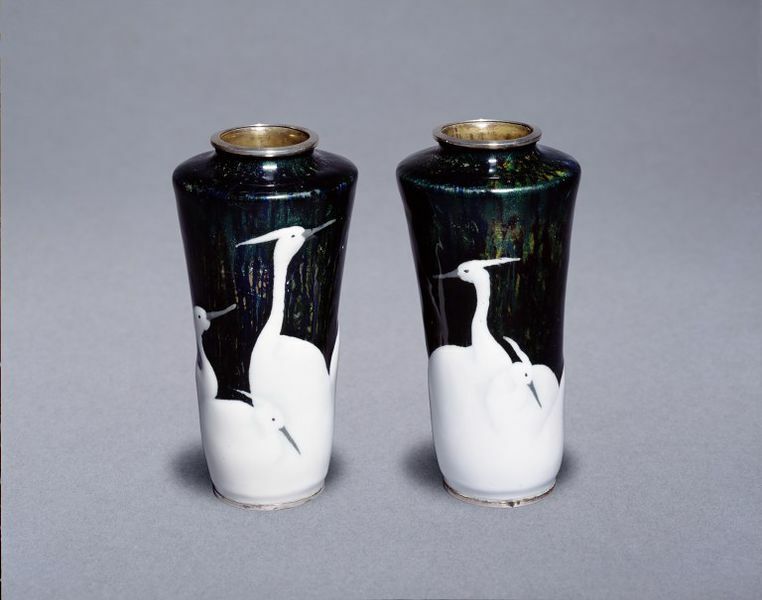 Each vase has a design of Little Egrets (Egretta garzetta) in musen and white and grey low-relief moriage (the edges of the egrets are raised above the body of the vases). The ground is of a flambé-style enamel. The two-character mark Hattori has been engraved directly into the silver-gilt interior of the base. The tentative nature of the moriage on these vases may well represent one of the first steps in the development of this technique by Hattori, to whom its invention is often credited. 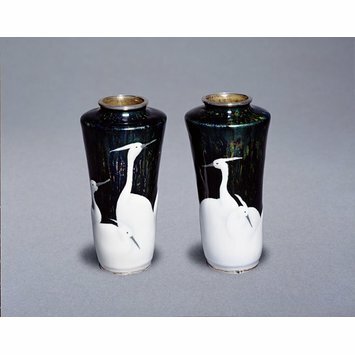 Pair of vases with design of white and grey little egrets, in relief on a ground of flambé-style enamel. Both with the mark of Hattori Tadasaburo. Cloisonné enamel design in both musen (no wires) and moriage (layers of enamel in relief). Pair of cloisonné enamel vases decorated with a little egrets, mark of Hattori Tadasaburo, Nagoya, Japan, c.1900-10. Irvine, Gregory. Japanese Cloisonné. (London:V&A Publications, 2006), p. 128. Irvine, Gregory. Japanese Cloisonné Enamels. (London: V&A Publishing, 2011). pl. 42.